With the unrelenting rain fest in the the Pacific Northwest, the only two places with some degree of sunshine was 90 miles to the east, in Central Oregon and 350 miles to the north, on the Sunshine Coast of B.C.. Needing more shots of the "dry" side of the Cascades in the Gorge, it seemed like a good time for some late afternoon photography. The rain and mist grew heavy in the waterfall part of the Gorge, but blue was visible in the East! 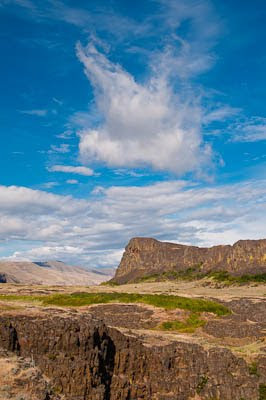 A prominent formation of basalt known as Horsethief Butte always looked like a great place to explore and photograph. Many years ago I made a brief stop and vowed to return. It was a great day here, but also a great wind was blowing from the west, which added drama, interesting cloud formations and swaying vegetation. 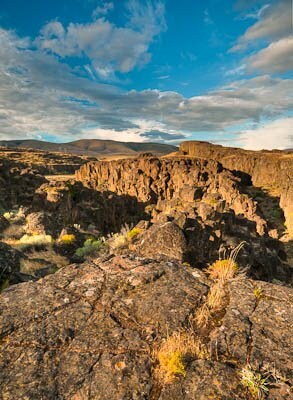 Horsethief Butte is a great promontory with interesting basalt formations and plant life. I climbed up the north side to do a bit of rock scrambling for fun. It was very windy, with gusts in the 35 knot range, so it was really blowing on top. Found a few back eddies to shelter from the wind and enjoy the view. After exploring the central part of the Butte, I took the trail around. Sun was beaming in and out of view and getting close to the hills in the NW. 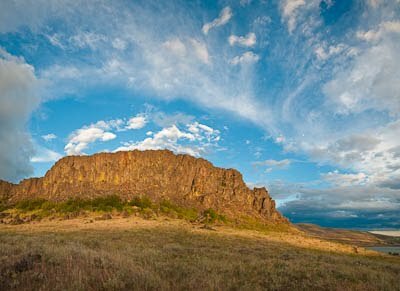 I set up for taking a panoramic view, hoping the sun would hit the Butte one more time before disappearing over the hills. I was rewarded. 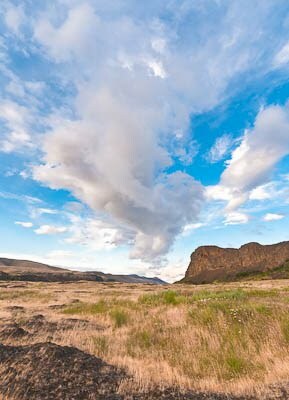 Strong winds and mountains can create interesting cloud formations. 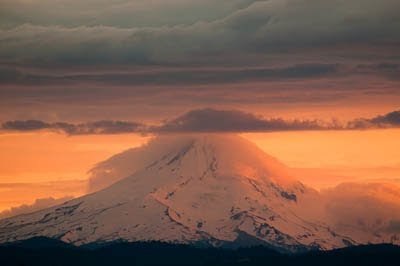 This long lenticular cloud formed down the Columbia River valley, constantly changing shape. There was also a bit of green in the grasses left before the heat of summer really takes hold here. The clouds and light looked like it might develop well over Mt. Hood, so a found a clear view and waited. Rewarded again with the clouds clearing away and lighting up like a neon sign at sunset. It was the longest day of the year, so it was getting late.